The Windy Ridge Ranch, east of St. Paul, in Woodbury, Minnesota, offers group riding lesson, a leasing program, and other fun riding activities for our students. 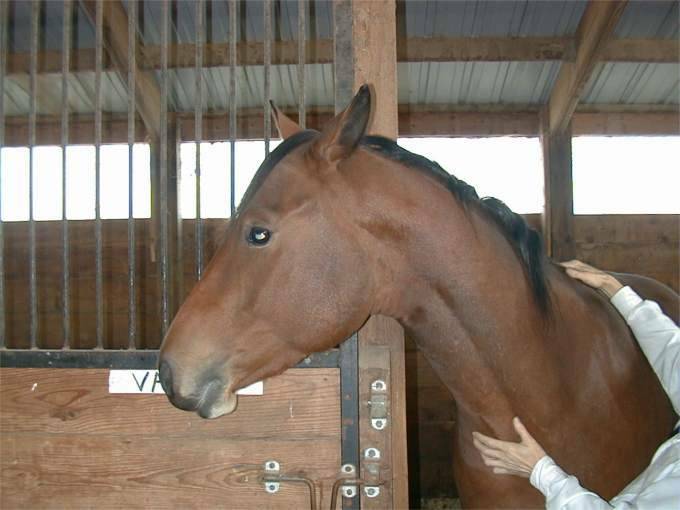 WRR is home to 40-some well-mannered schooling horses. Learn more about the ranch. Mark Ward started the Windy Ridge Ranch in 1979 and has been having fun teaching riding lessons and horsemanship ever since. It's a family-run operation, with Mark and his wife, Katie, as well as Mark's son Emmerson and daughter-in-law Susan and their 3 kids, Louisa, Lily and Talbot, all taking care of the horses. Lessons take place in one of our two outdoor arenas, inside our insulated arena, and on trails through our pastures and nearby fields. Register between now and May 6 for Session 4, which starts June 3 for Monday-Wednesday riders, and June 13 for Thursday-Saturday riders. Learn more about our Lessons and how to register and then come visit a lesson to see what it's all about. Louie is an eighteen hand, eleven year old Irish Draft gelding. He's at the WRR on a "lease to own" basis. His skills include all the disciplines of Eventing: Dressage, Stadium Jumping, and Cross-Country Jumping. He needs some conditioning this Spring and should be show-ready by Summer. Watch for him at Otter Creek! Photos of Louie jumping at Otter Creek! Paris, a 20-year-old Quarterhorse mare, came to us from a long-time riding student. We are happy to have her join our herd and program! 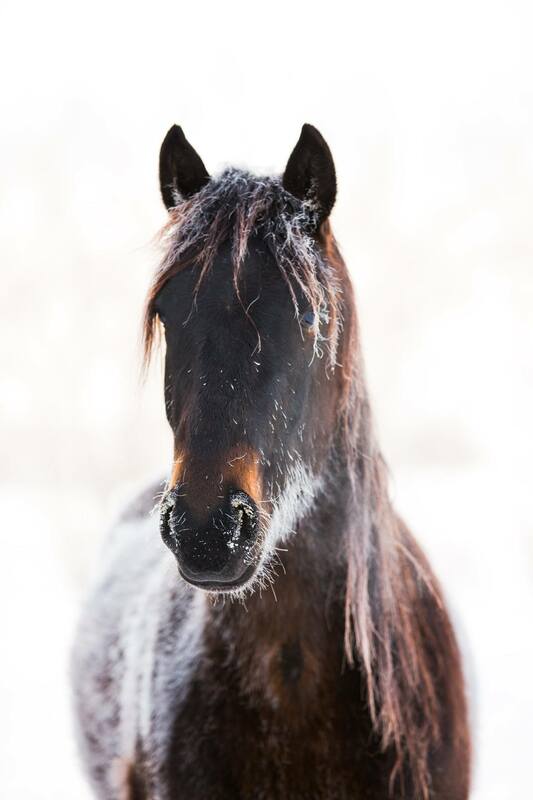 Amanda Plucker captured this remarkable photo of Clover in February 2019. And here's one of Springer with frosty whiskers. Beauty magnified by a harsh climate. Bongo has learned to Sit on Command! You've seen Bongo and Cara K. show creative costumes --- now watch Bongo show off his new trick. Flash was euthanized after breaking his leg, caused by a badly placed kick from another horse while running and playing. Flash was a favorite horse and still near his prime -- a great loss for us. He will always be remembered as The Amazing, Blazing, Super-Fantastic, Flash of Glory! Where's all the snow? Remember the fun we had? Springer turned 7 months old on December 19. He's hanging out with Bobaloosa and will will join the herd after being gelded in the spring. See a slide show (only works on a computer, not a phone) of Springer photos by Amanda Plucker -- made into a little video too. Granite, age 22, died this day, 12/22/2018, of natural old age causes. It appears he had a sudden and quick aneurysm. It was unexpected in that he has seemingly been feeling fine. His current lessee, young Anna Noel, gave him almost daily loving attention lately. He looked great and seemed happier than he has in quite a while. Granite was an Adalusian-Quarter Horse cross - called an Azteca. Granite did it all, teaching young and old, Western Games, dressage and jumping, trail riding and the Winter Carnival Parades. The photo shows Granite at Otter Creek, doing an eventing competition with Maddy M. Rest in peace, dear Granite. Twenty four horses paraded in creative costumes, our largest costume event ever! Ten riders from the Windy Ridge Ranch competed in Dressage, Cross-Country, and Stadium Jumping. For a complete list of ride times, see the WRR Daily Calendar for each day of the show. All WRR riders with families and friends are invited. Square dancing, games, potluck dinner, silent auction, horse vaulting. Eleven riders from the Windy Ridge Ranch competed in Dressage, Cross-Country, and Stadium Jumping. This show was really exciting and very challenging for all these riders. Serious training effort was involved for all of us in preparation for this major regional show. At the Starter Level,Maddy Tibbetts, in her first horse trial, placed 6th out of 17 on Raja. In a separate Starter division, Dani Miller and Spirit, both in their first horse trial, placed 4th out of 17. Nikki and Pippi, in Pippi's first horse trial, had a very good dressage ride and got through stadium fine, but Pippi was overwhelmed out on that expansive cross country field. In Beginner Novice, Bella, in her first horse trial, and Ruby place 7th out of 16. Heather Enselein, in her first horse trial, sailed through all the jumping parts on Izzy. In Novice, Aleka Lazenberry and Dr. Watson did their best ever in dressage and placed 7th out of 11. I rode Lulu in the same division, for her first horse trial. Lulu did fantastic in dressage and cross country but stopped out in stadium -- just too scary! Stella had a beautiful dressage ride but retired half way through cross country when Kestrel became way too fast and unrideable. Good call. Molly Prytz and Meeko were 2nd out of 21 after dressage with a 27.9! But Meeko didn't want to play on cross country day. Louisa did her first ever Training ride on Wonder, with beautiful rides in both jumping phases, ending the weekend in 5th place. Mark and Juniper got 1st place, out of 11, in their Training division and were the only ones to make time for cross country! Our drill performances were exciting to watch and fun to perform! All your favorite horses rode in intricate pattern to music. Washington County Fairgrounds in Lake Elmo. Our half-time entertainment was "Crazy Poles." Third annual Horse Trial at the Windy Ridge Ranch -- RESULTS. Dressage "Ride-A-Tests" happened June 16 with judge/trainer Janna Kysilko. We were rained out for cross country that day, and stadium is happening sporadically through the week. We are excited to try out our new cross-country jumps for this horse trial! Wilbur was euthannized in June when his knee arthritis became too crippling. He had a fun horse personality and will be missed by many. Results: Mark and Juniper 2nd in Training, Louisa and Wonder 6th in their first Training. Molly and Meeko had a successful finish for their first Training. Dani, Bella, and Maddy T (on Spirit, Ruby and Raja) finished their first recognized show at Beginner Novice. Dani got 5th. Nikki took Pippi through her first show and had a great jumping round. Katie took Lulu to her first recognized show and finished 2nd in Beginner Novice, with the lowest Adult Rider dressage score of the day. It was a hot but successful day of dressage and jumping. Sage had her foal on May 18, 2018. Katie was at the WRR and helped make sure the foal was safe and sound upon delivery. Amanda Plucker has taken a great photo of the foal on his second day. Springer needed a little help getting up at first, but as you can see in the video taken on day five, he's ready to run! Sage has all the right maternal instincts and it's going to be fun to watch the little colt grow up. And little Springer might end up being pretty big. Springer's sire is a 17.5 hand Irish Draught, Beeston Laird, standing at Blackshire Equestrian Center in Randolph, MN. Here's a good close-up of the little guy (thanks to Amanda Plucker). Photo of Mark holding Springer (thanks to Dani Miller). Five riders from the Windy Ridge Ranch competed in Dressage, Cross-Country, and Stadium Jumping. Training Level: Mark on Juniper, Novice Level: Molly on Meeko, Louisa on Wonder Girl, Aleka on Dr. Watson, Beginner Novice: Stella on Kestrel. Results: Mark - 4th. Molly - 5th. Louisa - 7th. Aleka - 8th. Stella - 3rd. Congratulations to all these riders. This is a major regional show and a lot of serious training effort preceded these rides. Bella demonstrates smooth vault-on mount. Light as a feather swing-up. How does she do that (you should ask)?! Our team will be performing at WRRHC fun shows and at the Washington County Fair again this year! We have added 11 new jumps from the Roebke's Run X-Country course. The team will perform at the 2018 Washington County Fair on August 2nd at 7:00 pm. Here are videos of our last performance. 2018 DT Pattern, carefully drawn by Heidi M.
See more stories, photos, and videos of Windy Ridge Ranch activities.